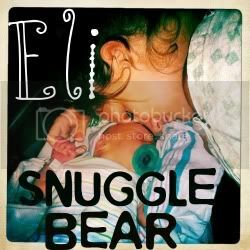 Snuggle Bear Eli: 'Family' traditions. Today I decided to join the rest of the parents in tradition and take my son to have his picture taken with Santa. I'm not sure what I was hoping to get out of it, but it seems like all I got was a loss of 24$. It wasn't very memorable considering all I did was stand in line for 20 minutes, hand my child off to Santa, then go on with my not so exciting life. It's not like I was doing it to see the imagination of Christmas is Eli's eyes. He's too young to even grasp what's going on. On the other hand, the picture was cute. So did I do it just for the magic of the picture? I guess I'm not in the Christmas spirit. As I stood in line pondering all the family's, Mom, Dad, kids. I couldn't help but to feel empty. A part of the excitement of brining your child to see Santa is being with the family you created. My little family happens to be quite broken. Just Eli, me, and my dad. Not the kind of family I was hoping for when I had my first kid. As much as my dad adores Eli, I know he'll never be able to adore him as much as Eli's own father would. (If he had one.) I wish I had someone to share these special little experiences with.Other then my dad, who has already done it with 5 of his own children. These kind of experiences are meant for the typical family with 2 parents and kids. Sadly, Eli and I aren't your typical family. Just another down fall of being a single teenage mom. So rather then embracing and enjoying the first time visit with Santa, I was more like, "I'm just doing this because this is what parents do.."